Heat coals or gas grill for direct heat. Cut four 18x12-inch pieces of heavy-duty aluminum foil. Spray with cooking spray. 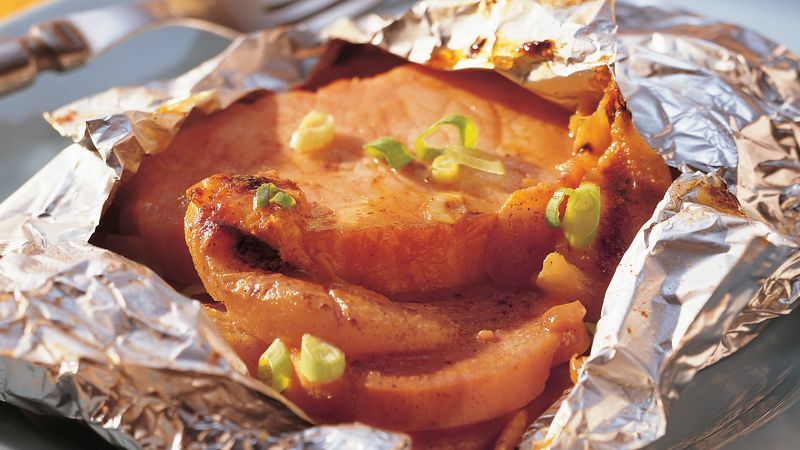 Place one-fourth of the sweet potato slices on one side of each foil piece. Sprinkle with salt. Cut butter into small pieces; sprinkle over sweet potato. Top with pork chops and peaches. Sprinkle with cinnamon. Fold foil over pork mixture so edges meet. Seal edges, making tight 1/2-inch fold; fold again. Allow space on sides for circulation and expansion. Cover and grill packets 4 to 5 inches from medium heat 20 to 22 minutes or until sweet potatoes and peaches are tender. Place packets on plates. Cut large X across top of each packet; fold back foil. Sprinkle with onions. Sliced apples can be used instead of the peaches or nectarines. It is not necessary to peel them. Smoked pork chops can be found at the fresh meat counter at the grocery store. They do not require a lot of cooking because the smoking process has done that for you. Just cook them until they are thoroughly heated.